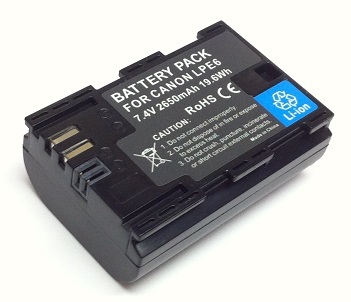 Home > Digital Camera Batteries > LP-E6 : 7.2 volt 2650mAh Li-ION battery for Canon 5D Mark III, 5D Mark II, EOS 6D, EOS 7D, EOS 60D, EOS 60Da, etc. 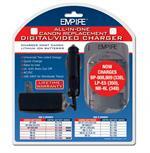 LP-E6 : 7.2 volt 2650mAh long-life rechargeable Li-ION battery for Canon digital cameras. Fits the EOS 5D Mark III, EOS 5D Mark II, EOS 7D, EOS 6D, EOS 60D, EOS 60Da, EOS 70D, Re-charges with stock OEM charger system OR with our DVU-CAN-R1.